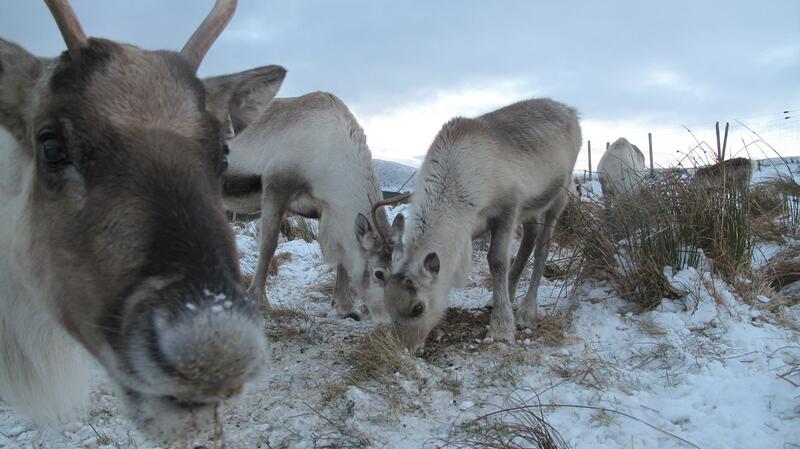 Reindeer are an integral part of life in the far north. The cultures there rely on the animals for transport, food and skins. 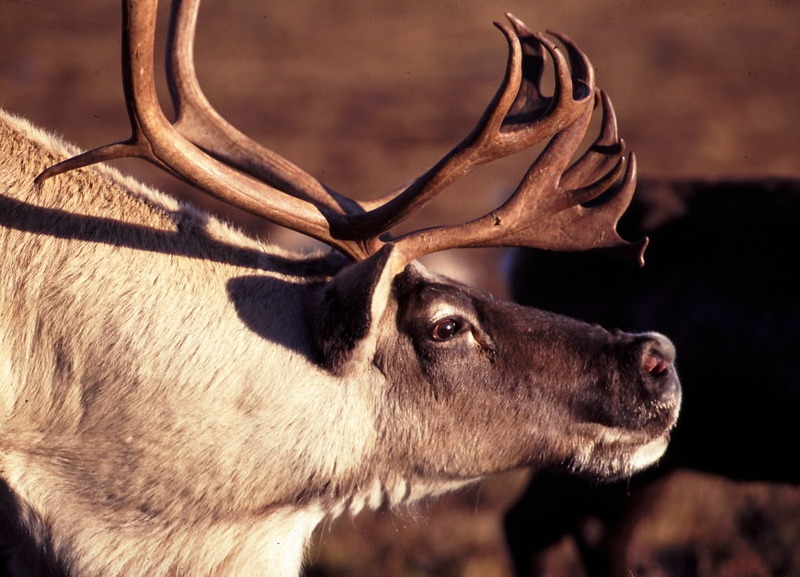 Reindeer are the only animal suited to the cold that can provide the people living in the arctic regions with animal protein. They are raised for venison but almost all parts of the animals are used. The skin is an obvious, valuable and extremely useful product. The skins are used for clothing, rugs and numerous other everyday items. 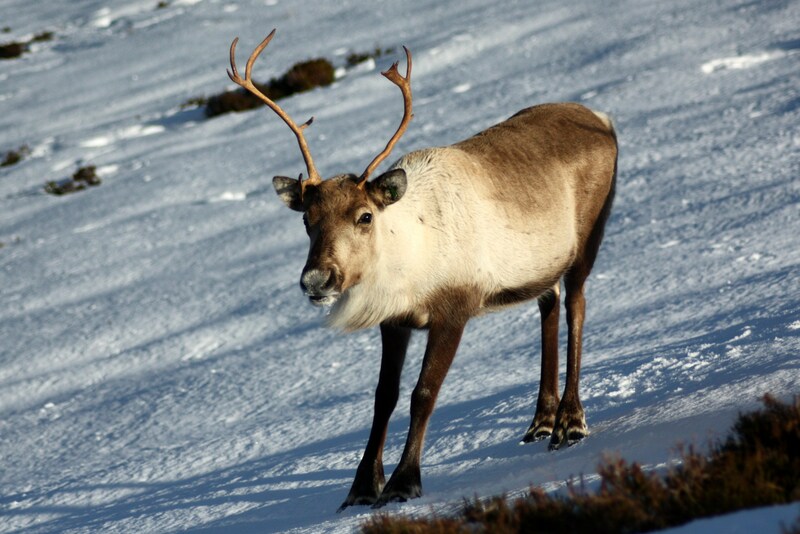 Reindeer are used as draft animals – transporting both people and freight from A to B. Many of the people of the far north are nomadic. Families or groups migrate large distances to access seasonal pastures. Their reindeer graze and grow and then move on and the people who own them travel with them. Their possessions are on sleighs or directly on the backs of the reindeer. This blog will highlight some of the many arctic cultures and people, and discuss how these people live and especially how they care for, work with and use reindeer. Reindeer harnessed for a demonstration of sleigh pulling. Photo taken during visit to Sweden in 2008. During a cold winter in Sweden, reindeer historically provide the main means of survival. Photo taken during visit to Sweden in 2008. Nenets herders of Russia travel up to 1000km seasonally to survive the challenges of life so far north. The Nenets form the largest group of people in Northern Russia totalling around 40,000 people, with some 700,000 reindeer. The Nenets eat reindeer meat and use the skin of the reindeer as clothing. 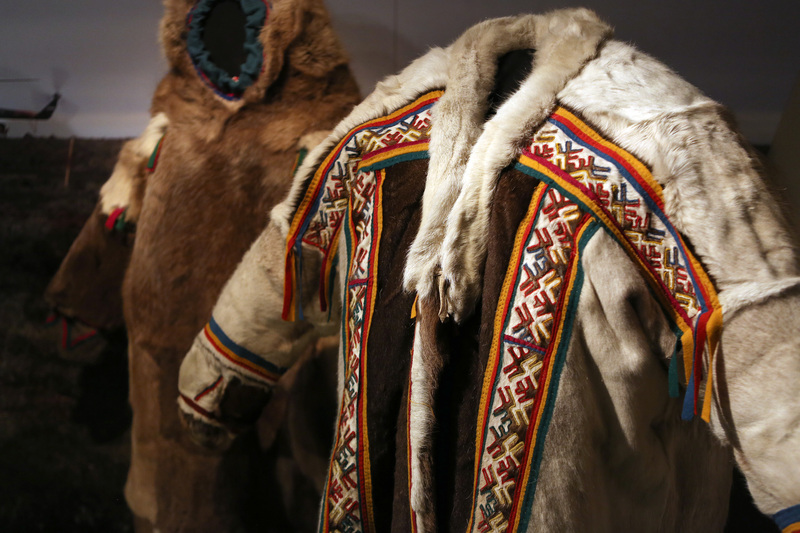 A warm jacket made of reindeer skin from the Nenets culture. Photo from Wikimedia commons. The Chukchi people of Eastern Russia trade reindeer meat and skins with coastal people who provide whale fat and seal skins. The Chukchi people make their tents out of reindeer skins. The Evenki people in China live with small numbers of reindeer who are milked and used for transport. The reindeer are highly prized and not slaughtered for meat. The antlers are taken and used in traditional Chinese Medicine. Sami people are the indigenous people of Scandinavia and today live in the far northern areas of Norway, Sweden and Finland. Currently around 3000 people in this area are involved full time in nomadic reindeer herding. 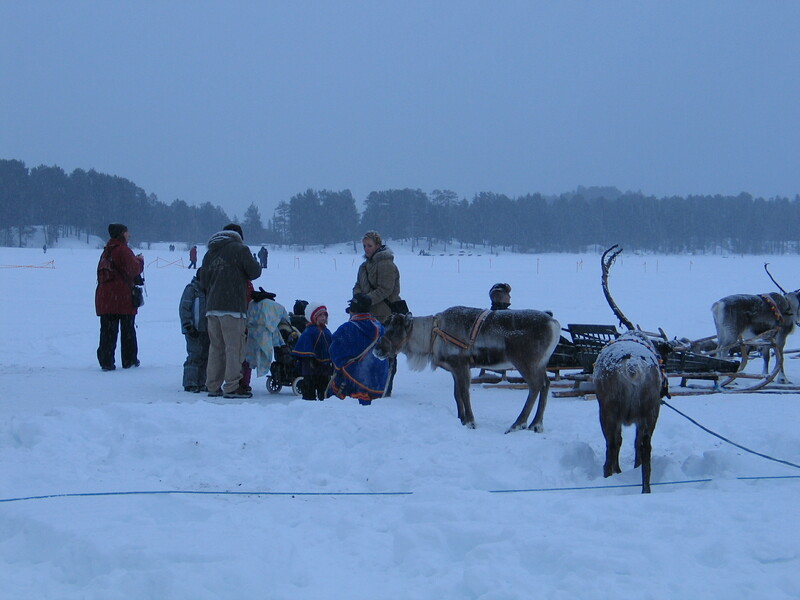 The Sami culture is famous for its connection to reindeer. 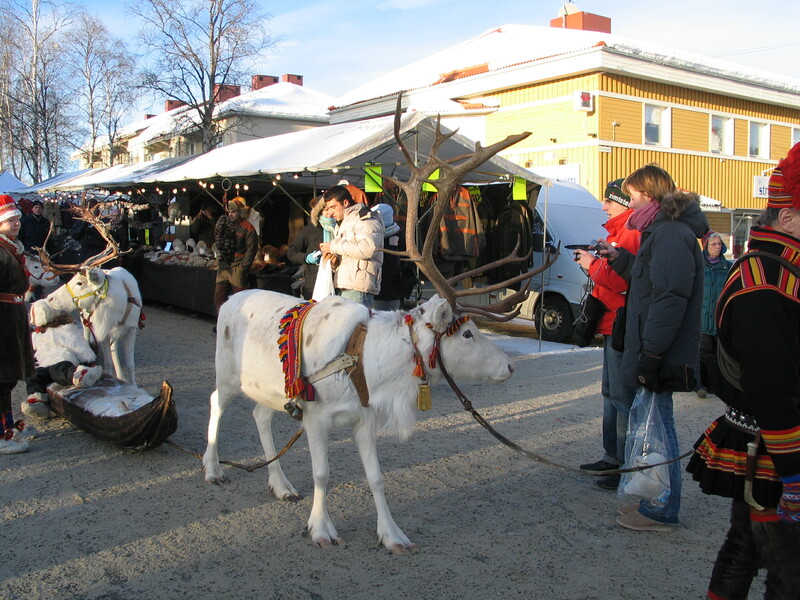 The Sami people produce wonderful crafts and engravings often using reindeer antlers and skins. 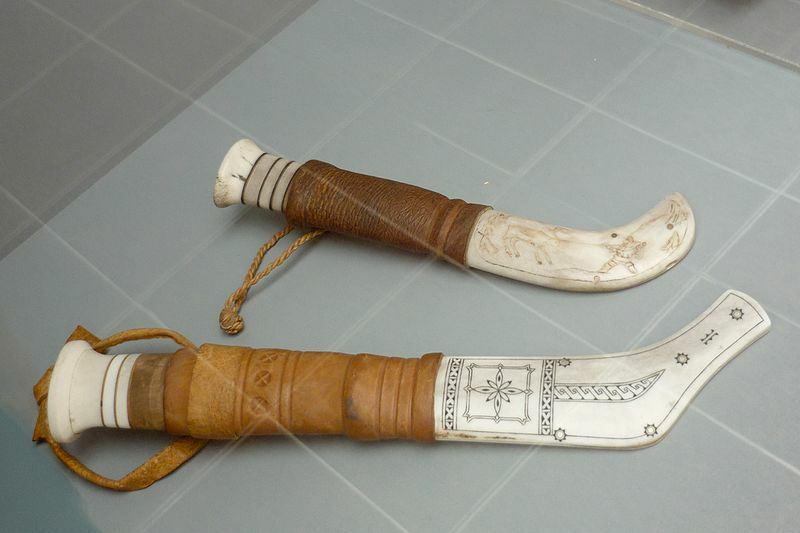 Knives made by people from the Sami culture. Photo from Wikimedia Commons. Reindeer herding is big business in the Arctic regions and without reindeer the survival of the people and their cultures would be in question. 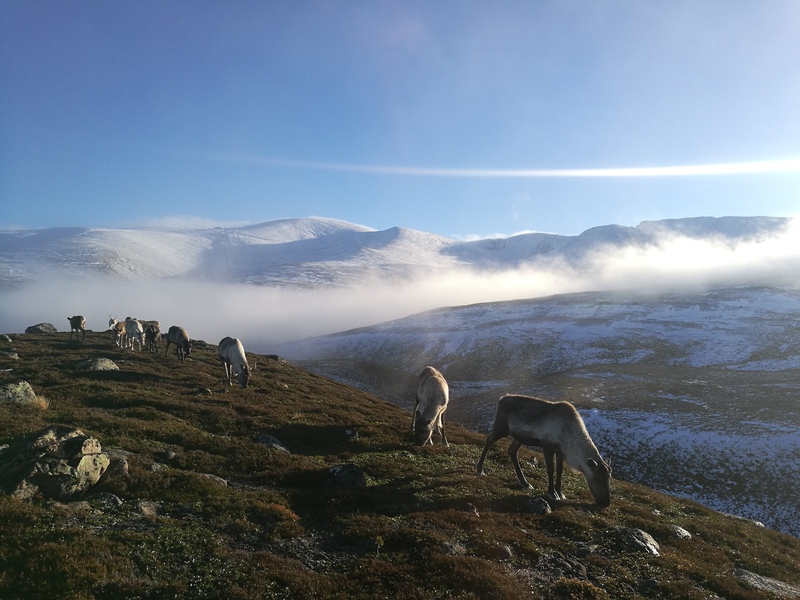 The Cairngorm Reindeer herd was of course established by a Sami reindeer herder. 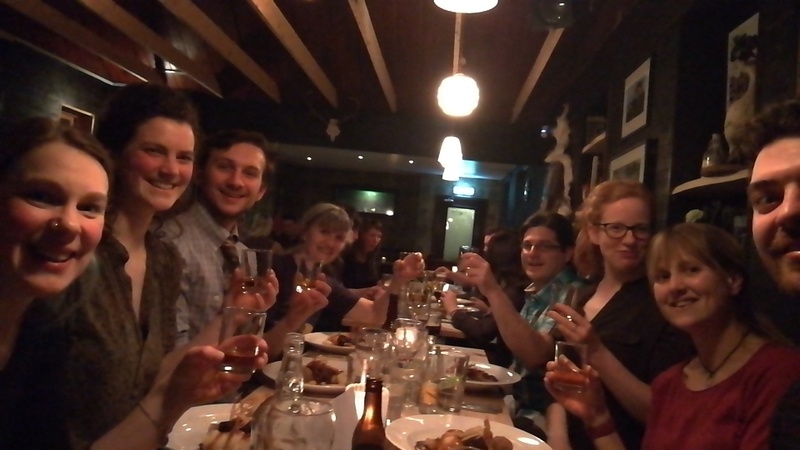 Mikel Utsi came from Swedish Lapland and brought his herding, reindeer husbandry skills and Sami culture with him to Scotland. These skills and culture continue and live on through us and our herding here in the Cairngorm National Park. 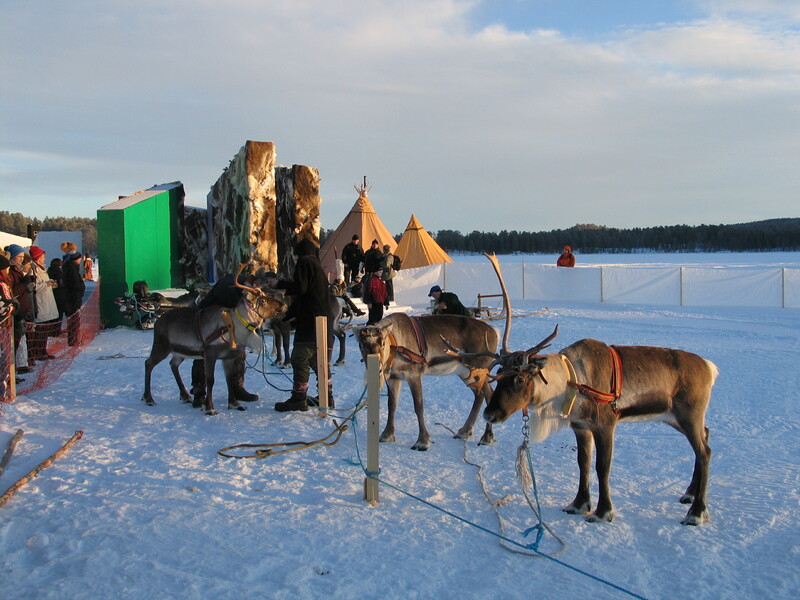 A reindeer pulling a sledge in Sweden. Photo taken during visit to Sweden in 2008. 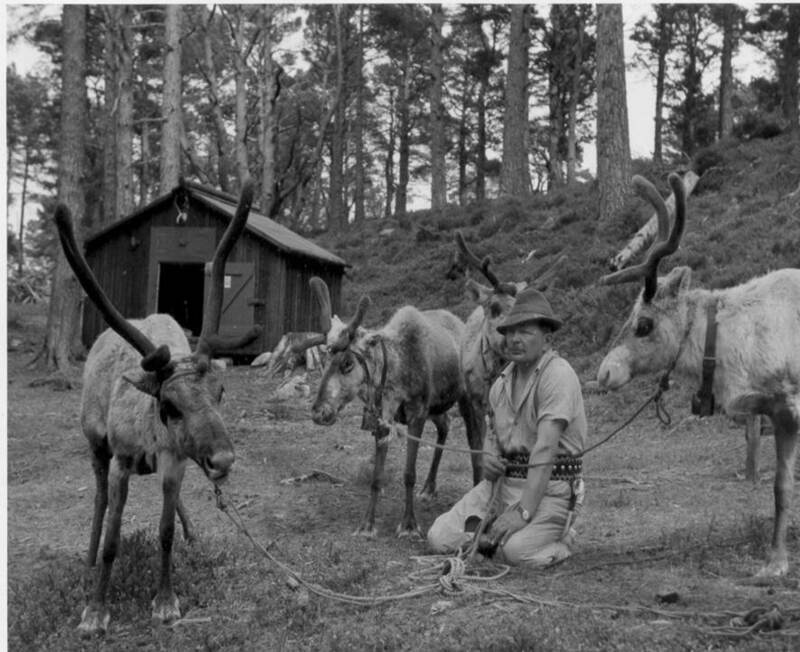 Mikel Utsi with his reindeer – originally from Sweden – in our current hill enclosure in the 1960s. 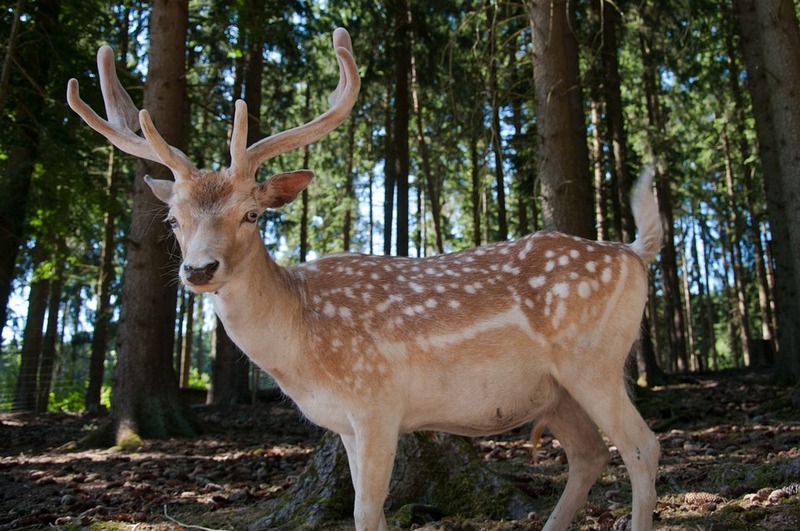 Deer in general are fairly quiet animals, uttering little or no noise in their daily lives. However there are two quite vocal times of year, in the spring when female deer calve and in the autumn when the males are competing for the breeding females. In spring time whether it is a Red deer hind, a Roe doe or Reindeer cow they will call softly to their young when they are looking for them. In May time when our reindeer calves are born the mothers can get quite agitated if their young calves are not right beside them, grunting incessantly to call them back. 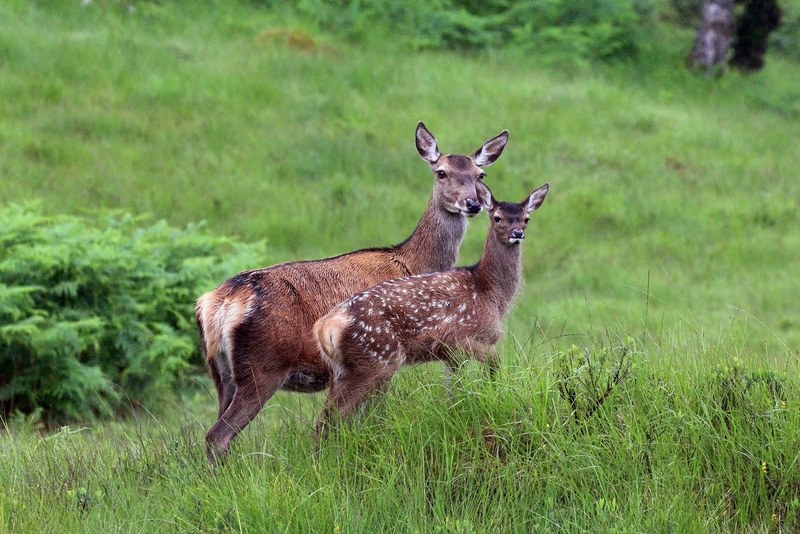 Red deer hinds ‘mew’ to their young calves and a Roe doe gives a low whistle when calling her young. But the call of the rutting males can be quite different and is sometimes meant to warn off competing males and signal ‘how big and tough’ they are. At this time of year in the forests and glens of Scotland the red deer are in full rut and they make a fabulous bellowing noise rather similar to the roar of a lion. There have been scientific studies on the meaning of bellowing and it has been proven that the more times a stag roars at one session the more likely he is to be a successful breeding male. 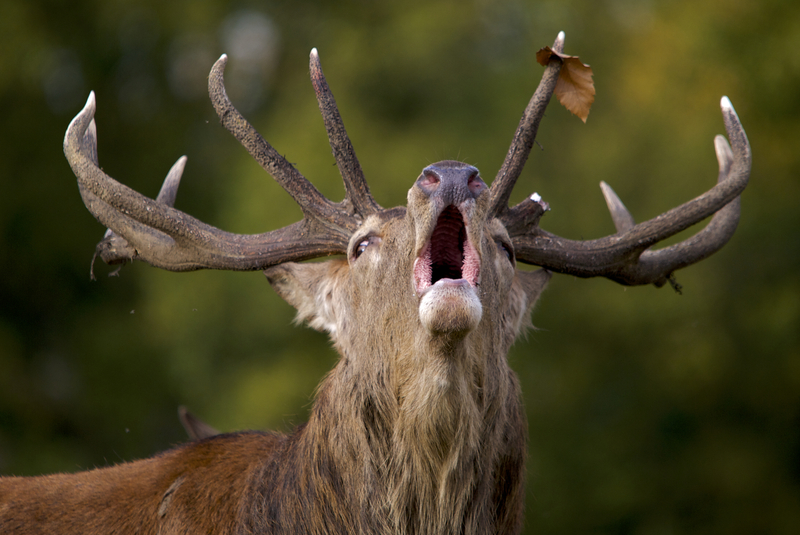 A Red deer stag bellowing. Photo from Wikipedia Commons. 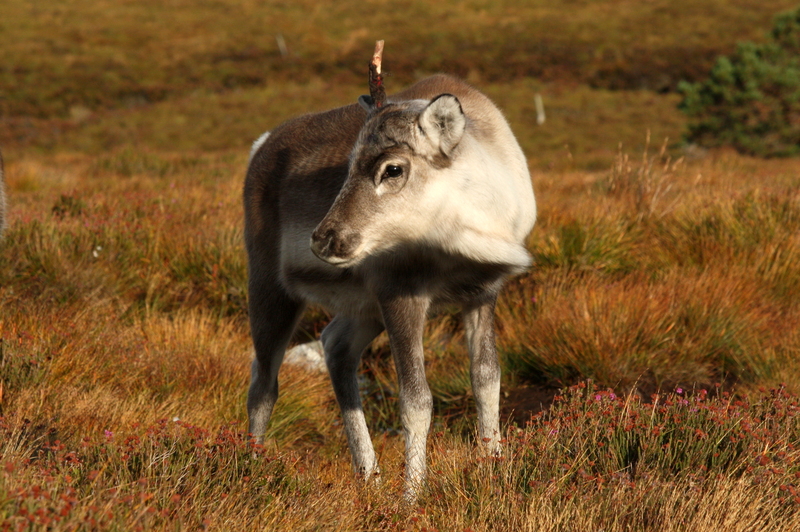 However Reindeer (and Caribou) do not bellow like red deer but instead ‘grunt’ rather like a female calling to her calf, but more ‘gutteral’. And the grunting only really takes place when a bull is chasing after a cow. It is not a loud noise and certainly is not a threatening call in the same way as the red deer bellowing. 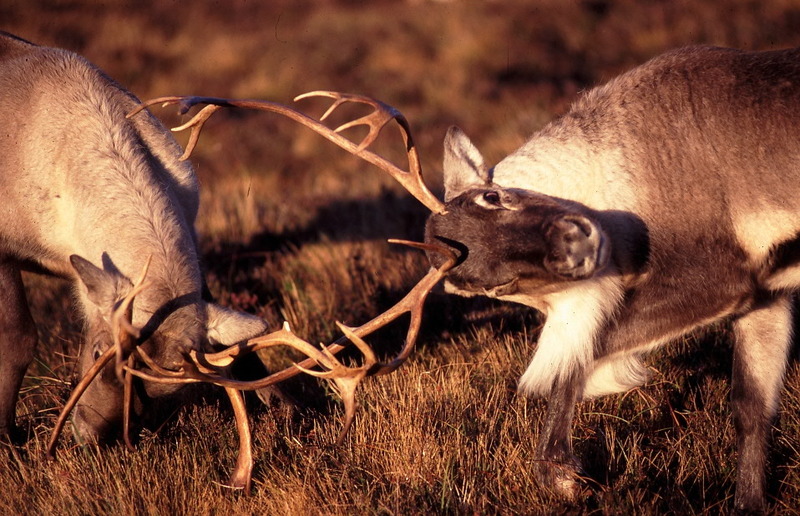 A tussel will often follow reindeer grunting, with the winner going on to breed with the females. Roe buck, patrolling his territory will bark (like a dog) to challenge other bucks who dare to step a foot in his domain and Fallow bucks are different again, issuing a husky, rolling grunt in an attempt to attract the does and warn off other prospective males. 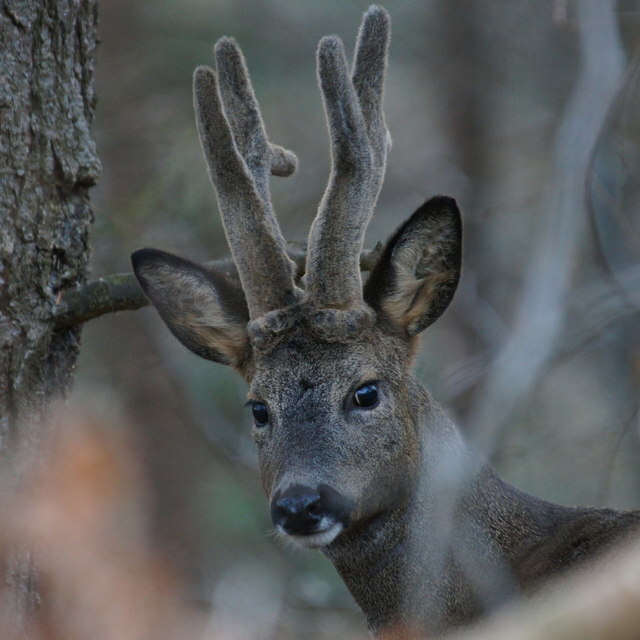 A Roe deer buck with velvety antlers, just before the rut. Photo from Geograph. 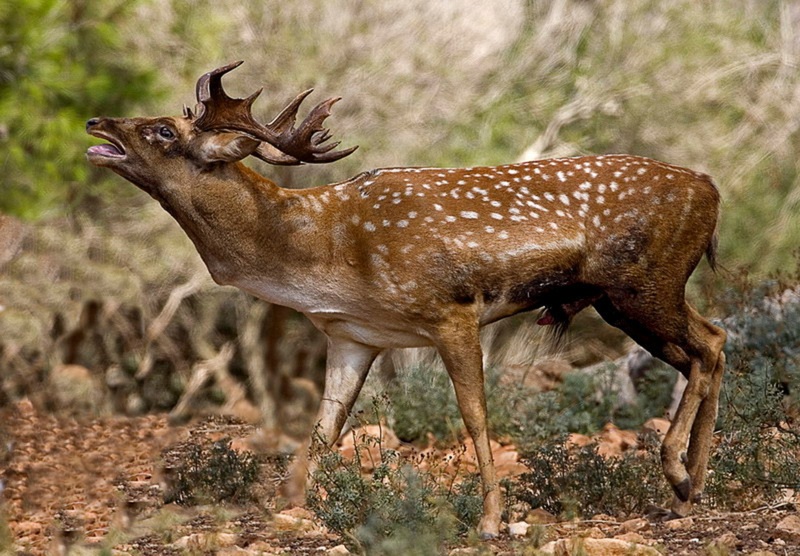 The grunt of a Persian Fallow deer buck, to warn off competitors. Photo from Wikipedia Commons. The non-native Sika deer, which were introduced into GB at the turn of the last century, have a characteristic kind of whistle, which turns into a high-pitched scream during the rut. The more delicate looking of deer species in rutting season, a male Fallow deer. Photo from Max Pixel. So there is a vast variation of noises from grunts to screams, even among the deer found here in Great Britain. So if you go out in the countryside at certain times in the year and hear something unusual, don’t take flight, it will probably be a female and young calf, or else a harmless male deer in full flow because it’s the rutting season..
Every year when the cows and calves come off the high tops from the summer one group tend to head towards Glenfeshie, a part of the Cairngorms they aren’t meant to be. We have got good communications with the landowners and gamekeepers over there so they let us know and we head over in the mission to catch them. It is always the same culprits. To name a couple– Fern and Wapiti. 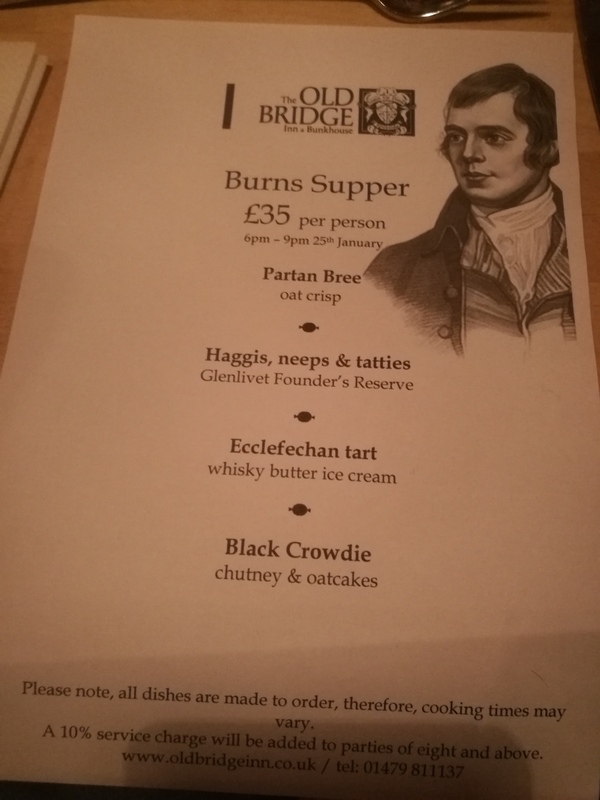 You may remember a blog in October of Andi and I recovering Fern from Glenfeshie in the autumn so she must have gone straight back! 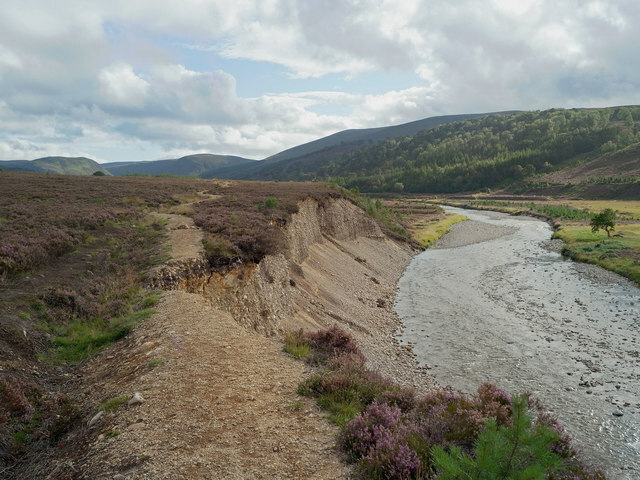 Glenfeshie, where the reindeer like to hang out. Photo from Geograph, labelled for reuse. Alex is chief free range reindeer herder and knows the hills best over there so he headed out the first few times to catch up with them. Once he knew their location he set up a corral with a few gates in the aim to catch the naughty reindeer. This all happened over the Christmas and New Year period, they like to pick the busy times! Alex went out a few times and fed them which gets them used to the feed again and a bit easier to manage. In the group were three calves who weren’t yet trained so they were fairly timid and didn’t let Alex get very close. But then we got the phone call at Reindeer House from Alex that he had them all in… calves included. Ye-Ha!!! It can be hard to spot reindeer on the hill at the best of times, but especially in these speckled snow conditions. Photo from Wikimedia Commons. So Chris and I got everything together and headed off in Brenda (this is the name of our wee livestock truck). Alex was going to start putting halters on them. When we arrived it materialised Alex wasn’t on his own. With Emily (his wife) and two month old son in toe the three of them had caught all the reindeer. Start them young! Being the holiday period the hills were pretty busy with people walking and there were a few dogs around so Emily was on people and dog duty while we walked the reindeer up to the livestock truck. Remember the calves are pretty wild and not halter trained so there was a lot of persuasion going on. Luckily all their mothers are halter trained so they were easy. So in two runs, we walked all 11 reindeer up to the livestock truck and loaded them. 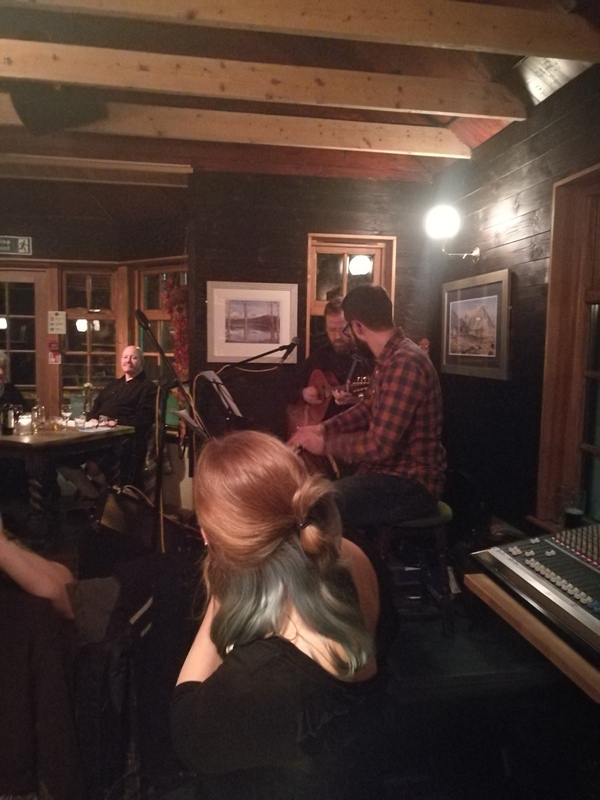 Fern – the Glenfeshie girl. On route we phoned the Centre to get extra pairs of hands to lead them across to our enclosure where they have now been for a week. The calves are getting more and more bold everyday, eating the mixture and now joining in with our daily guided tours. It won’t take long for them to get pretty tame… the great thing about reindeer and thousands of years of domestication means working with humans comes second nature to them. We will halter train them over the next few weeks. Their names are Keats, Blyton and Harper to fit into our 2017 naming theme of poets and authors. Parmesan and her big healthy female calf Blyton settling into the enclosure and getting used to people beinging food. And all watched closely by Morven (on the left)!